The speedy Take The One o One was bred by Thomas Bachman, who sold him for $47,000 to Jay Em Ess Stable. He was sired by Acclamation, who ended his career with a five-race winning streak that included the 2011 Pacific Classic and Eddie Read Handicap. His Dam is North Freeway and Brian Koriner his trainer. A California product through and through, Take The One o One made his debut at Los Alamoitos in a 2017 July maiden special weight race, finishing second overall. The colt would eventually break his maiden at Del Mar in an allowance where he bested General Interest and Shackalov over 6 furlongs in a time of 1:11.65. Next up, he switched surfaces and competed in the Del Mar Juvenile Turf in September and would start well. As an 11/1 outsider, Take The One o One trailed in third for much of the race. When called upon down the stretch, he failed to fire and seemed to shrug off the urges or regular rider Joe Talamo. He would finish 7th overall. Undaunted, Take The One o One would be sent to the 2017 FrontRunner Stakes. Out of the gates, the colt enjoyed a solid early trip and set the pace as a 70/1 longshot with 4/5 favorite Bolt d’Oro drafting him from behind. 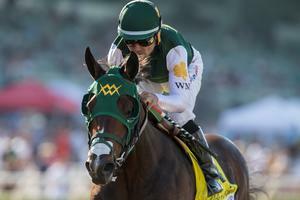 He showed out well over the course of the race, setting fractions of :23.17, :47.23 but was overtaken at the quarter-pole by Bolt d’Oro and Solomini. The pace setter fought hard to hold on for third place overall in the 2017 Front Runner but was 10 lengths back of Bolt d’Oro. The plan for Take The One o One reamins to be seen with his sprinter running style and speed is certainly present. At 1-1-1 in four starts, he has earned back his purchase price with $81,345 in career earnings. If his team can harness his speed moving forward, he could be a threat for the 2018 Kentucky Derby but he may be relegated as an afterthought until he proves he can use his speed as a weapon at the right time.